This is my first Father's Day as a father myself, although I don't yet really think of myself as a father despite the fact that I'm fairly certain I am one. There are these two wriggly, lovable little poop machines that are always around and who I'm expected to help care for, but I don't yet feel like a father. Heck, I don't yet feel like an adult. Most mornings when I wake up I'm still amazed I graduated from high school. Some other mornings I think I'm still in college... and then I remember that yes, I am still in college. That said, if this is what Father's Day is like, I'm happy to report that I'm looking forward to the next one. Blueberry muffins, printed pictures I've been asking for since the kids were born, and a new copy of Portal 2? Yes, please. Daddyhood is good. The kids gave me some poop... which I didn't really want, but they made it themselves, and I guess it's the thought that counts. When I think of Father's Day, I don't think about myself - I think, as we should, about my own father. He was the only real strong male presence I had for most of my young life, both of my grandfathers having died relatively early. 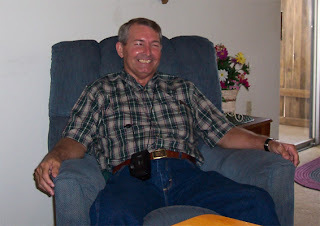 I think I'd like to write a bit about my father today - Gerald James Lemoine, the Senior. He was a deeply flawed but nonetheless amazing person. That's kind of neat to me, because I'm at least smart enough to know that we're all deeply flawed. I'm deeply flawed, and maybe you are, too. However, there are very few of us who are nonetheless amazing. I'm not. You might be. Dad was. In a way, compliments about my father are difficult to write. He made me miserable for pretty much the entire time I lived at home, and is a big part of the reason I left home so early. Not many people graduate high school at 16 and leave home for good a few weeks later, with a pickup truck full of boxes and a single twenty-dollar bill. I did. I'll never forget that day - Dad was out on his tractor taking care of our land, like he usually was on Sunday mornings. Mom was on the riding lawn-mower, doing what she loved to do in the back stretch. I packed and left alone. It was surreal. In a way, it was typical. My father was a good looking, fun-loving teenager at one time, with a desire to prove himself and do some good, and little patience for formal schooling. He was the stereotypical mid-twentieth century young hot-rodder. He was known for being cheerful and witty, and from what I understand, he was also known for flirting with the ladies and taking good care of his brothers and sister. Then he went to Vietnam to fight for his country, and everything changed. He never told me much about his war experiences, even when I asked and pressed him about it. I remember in eighth grade I was assigned to write an essay about any living American soldier, so naturally I picked my father - easy access. I found that essay a couple of years back - it's about the vaguest thing I've ever read. He described himself as an average soldier, doing nothing of consequence. He really didn't tell me much of anything. He didn't want to, couldn't bring himself to go back. Vietnam changed him, in more ways than anybody ever realized. He returned quietly, a different man. The fun-loving and witty side of him was buried. He was a hard worker and a hard man, prone to alcohol abuse and violent fits of temper. He married his childhood sweetheart, but wasn't able to have kids - after years of trying he gave up. The doctors told him that due to some malaria he'd contracted overseas, he would never have children. He and his wife were depressed. They talked about adoption, but never got around to actually doing it. Then a few years later, his wife got pregnant, and the baby who wasn't supposed to even exist was born. That was me. I don't remember all that much about my home childhood, and what I do remember isn't very happy. Don't get me wrong - my father never physically abused me or my mother, at least not that I know of. The unhappiness was more the result of a constant fear, the kind of fear a lot of kids of veterans probably know well. My father just wasn't a happy man, and the drink made him angry. He took it out on his family, and that's why as a child I never had the chance to grow close to him. I was too busy being terrified of him. I remember being overjoyed whenever he had to go out of state to work, meaning he wouldn't be home for days or weeks - isn't that sad? It's really sad. He was a mean, dangerous person, and I did my best to stay out of his way. I can't tell you how many nightmares I had about him. No marriage can survive well like that. My mother left my father a bit after I left for college - she disappeared in the middle of the night. My father called me the next day crying. I had never heard him cry before. He asked me where my mother was - I told him the truth: I had no idea. He cried some more, told me that he was going to make it right, told me that he loved her more than anything, promised me that he would fix this. My father would never see or talk to my mother again. It was a rough few months. I drove home to visit one weekend, only to find that my key no longer worked; my parents had sold the house. Everything was being split up. The divorce was official, and most of my old childhood stuff went missing. To this day, I really don't know where a lot of the stuff from my youth is. Terrible things happened to Dad, and as much as I now hate to say it, he fully deserved and even needed those terrible things. Something snapped in my father after that, and for once it was a change for the better. He started getting in touch with old friends he hadn't bothered to contact for years. He started spending more time with family. He made it a priority to be friendlier, to get out more, to have a life beyond work. He drank less and joked more. He changed - it took his whole world falling apart and losing so much of what he had, but he was better for it. When I was ten years old he was an angry old racist alcoholic who lived in a nice house with lots of land. By the time I was twenty-two he was a happy young man, open and friendly no matter what people looked like or where they were from... and living in a tiny trailer. He downgraded his living space and upgraded his life. Family members and old friends of his were constantly approaching me and telling me that this was the "Jerry that they knew," the Jerry that they'd thought was long gone, the Jerry from before the war. Suddenly, he was an amiable guy, still a hard worker, but full of joy rather than angry and bitterness. He was the guy who always stopped to help when he saw someone with a broken-down car on the side of the road. He was the guy who would barbecue way more food than he could ever eat, and invite all of his neighbors - black and white - to come join him. He was the guy who was always house-sitting for people he barely knew, taking care of pets and kids for friends. He was the guy who was always giving his money away to those who he felt needed it more than he did... which was just about everybody. The divorce changed my father more than I can possibly put into words, and it changed our relationship. Somewhere around the year 2000 or so, I suddenly had a father. It felt like it was the first time in my whole life we'd actually had a relationship beyond chores, screaming and arguments. He was genuinely interested in what I was doing, and we genuinely wanted to spend time together. He took me to my favorite hamburger joint in our old home-town; I took him to the Roy Rogers museum in my then-home of California. I'll never forget how proud he was at my wedding, and I'll never forget how he was the last person to leave the reception, how he stood out in the parking lot waving happily as Debby and I drove off to begin our new life together. By 2003, we had a great relationship, I loved my father, and everyone thought we had all put the tragedy of his Vietnam experience behind us. We were wrong. That was the year we found out that he had been exposed to an inordinate amount of Agent Orange... and it had given him multiple forms of cancer. I flew back from California to visit him for a week - he cried when I left, the second time I'd ever experienced that. He thought we would never see each other again. He was wrong - I moved back to Louisiana a few months later, and we had about 16 months left after that. We saw each other almost every weekend, watched TV, ate together, and made fun of people like Kenny Chesney. Dad was positive and happy as he could be until the end, even as his body slowly wasted away. He deserved a better end, and he deserved a longer life. His funeral was a very full affair, packed with people who loved the new Jerry, who was so much like the old Jerry. After he passed, among my inheritance was his old U.S. Army scrapbook and records. He had never before let me so much as touch this stuff, and I knew why as soon as I realized just how heavy his collection was. I never bothered to count how many medals he collected in the Army - it would have taken me too long. He was repeatedly decorated for valor and service above and beyond what was expected. The scrapbook was so full of honors and medals, it was almost ridiculous. He was a real American war hero, too humble to ever let a soul know. I never really got over my father's early passing. I still struggle with it. I try to remember him whenever things get rough in my life... because no matter how bad my life gets, it's never been as bad as his was. He made a lot of mistakes, insisted on living in the past, refused to move on, and was miserable for a couple of decades. He lost everything, learned to live for the future and enjoy where and who he was, and became one of the happiest, kindest, strongest, wisest men you'd ever meet. Despite the fact that he failed me for so much of my life, he came through strong in the end... and that's what really matters to me. He is my inspiration. And little Kristopher looks just like him.